The little car that could: a review of a 2005 Hyundai Elantra sedan. The vehicle I am currently driving is a blue 2005 Hyundai Elantra 4 door sedan. It was actually purchased by me in 2013, used, for my daughter as her first vehicle. She drove it for the next 5 years during which there were no major issues with the vehicle. Routine maintenance was provided to the vehicle during this time period. Overall, the vehicle show signs of wear and tear in it is interior and exterior that I believe are about average for a car of its year. The paint is wearing off in some spots, but not too noticeable. The interior of the vehicle is nothing fancy and not what it used to be but I find it fairly comfortable. Everything works as it should inside of the vehicle. I have been driving the vehicle for 3 months now because mine was totaled in an accident. It is not what I am used to driving but it is reliable and gets me from point A to point B. Compared to other cars I have driven, it is decent on gas and mileage. It has been relatively easy to take care of and only has required routine maintenance since I have been driving it. I do find that it accelerates very slowly and requires a lot of effort to do so, especially if going uphill. It accelerates even slower when running the air conditioner almost to the point of stalling. For this reason, I do not use the air conditioner. I also do not take it on the freeway or any roads that are fast paced because I do not think it would be safe. In general, it is not something that you could take on a cross-country trip, but more suited for short trips to work, school or the store. Great car, no big surprises.. Except for the reliability! Small problems like the window motor goes out, heating and ac only go from on to full blast, no levels. Overall I have had her almost 11 years and runs great. Very reliable. As a tall person, I often have a hard time fitting into small vehicles. While this is not a perfect fit by any stretch, it was one of the more comfortable cars for me to drive in this size and price range. They're cute and small, not known for their maneuverability or speediness. My mom refers to this car as a roller skate, to give you an idea of how it handles. But I do not go fast and I do not care about a lot of pickup, I just want a car that'll get me back and forth to work all the time and this car definitely does! Enjoy this handy, zippy ride. It has good storage features - nice sized trunk and the seats fold down 1/3 or 2/3 so my golf clubs can poke through. The front doors each have deep troughs where I can store things and the center console has a shallow top section and deep bottom section. There is a deep storage tray below the radio and a hollow in the dash above the radio as well as a pop open glasses case above the rearview mirror. There are pockets on the back of the front seats, as well. It is a very reliable car, seldom needing repairs. It is really zippy and easy to maneuver on the highway. It has a nice big windshield and the dash does not obstruct the view. Elantra 2004 review... luxury car under 1 lakh !!! is it worth??? 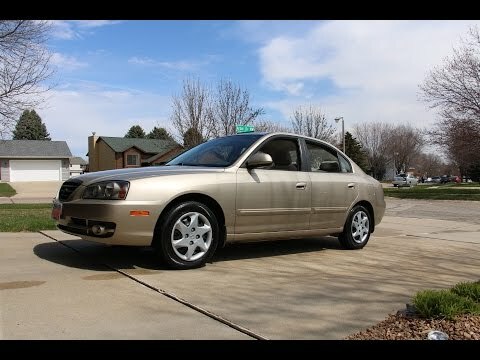 2005 Hyundai Elantra Review and Update! CERTAIN VEHICLES EQUIPPED WITH AN OCCUPANT CLASSIFICATION SYSTEM (OCS) FAIL TO COMPLY WITH THE REQUIREMENTS OF FEDERAL MOTOR VEHICLE SAFETY STANDARD NO. 208. "OCCUPANT CRASH PROTECTION." THE OCS INSTALLED IN THE RIGHT FRONT SEAT OF THE VEHICLE MAY MISCLASSIFY A CHILD RESTRAINT SEAT (CRS) AS AN ADULT. THIS MAY OCCUR IF THE CRS IS INSTALLED AFTER AN ADULT HAS BEEN SEATED IN THE RIGHT FRONT SEAT. IF THERE HAS NOT BEEN A 'KEY ON' 'KEY OFF' CYCLE WITH THE RIGHT FRONT PASSENGER SEAT EMPTY PRIOR TO INSTALLATION OF THE CRS. DEALERS WILL REPROGRAM THE VEHICLE'S OCS ELECTRONIC CONTROL UNIT (ECU) TO REMOVE THE FEATURE THAT MAY CAUSE THE CRS TO BE RECOGNIZED AS AN ADULT. THE RECALL IS EXPECTED TO BEGIN DURING OCTOBER 2005. OWNERS SHOULD CONTACT HYUNDAI AT 1-800-633-5151.